Barrons recent Palm Beach Breakers Hotel top 100 + 400 female financial advisor three day convention had many male/female speakers. A woman from UBS Private Wealth Management spoke on: “Luxury Market Outlook: Investment vs. Indulgence”. A man from UBS Financial Services spoke on: “Retaining Heirs: Connecting with the Next Generation of Clients.” The unusual element was another infamous UBS honeypot on Barrons schedule containing: “UBS Senior Management Meeting Room (DNP) is open from 7AM – 7PM.” A reliable source partaking in the Barrons convention various seminars said the consensus was that UBS deviously was allowed by Barrons to create this honeypot for poaching female’s from other firms using the Barrons convention as a front. It is known that UBS has business interaction with Barrons while questionable awards are given to UBS salesmen by Barrons. Many UBS “plate licker” stockbroker salesmen offering free lunch along with indigestible boiler room sales pitches are awards by Barrons. The UBS “plate licker” sales pitches usually include a recruitment application/questionare. One of these salesmen is directly involved with the UBS alleged looting of the Gardiners Island family estate. The salesman and his wife moved into Eunice’s estate immediately after her death. Another Barrons awarded salesman takes over other UBS salesmen accounts who leave. Our reliable source alleged Barrons supplied UBS with confidential female stockbroker profiles of those entering the UBS honeypot recruitment room. 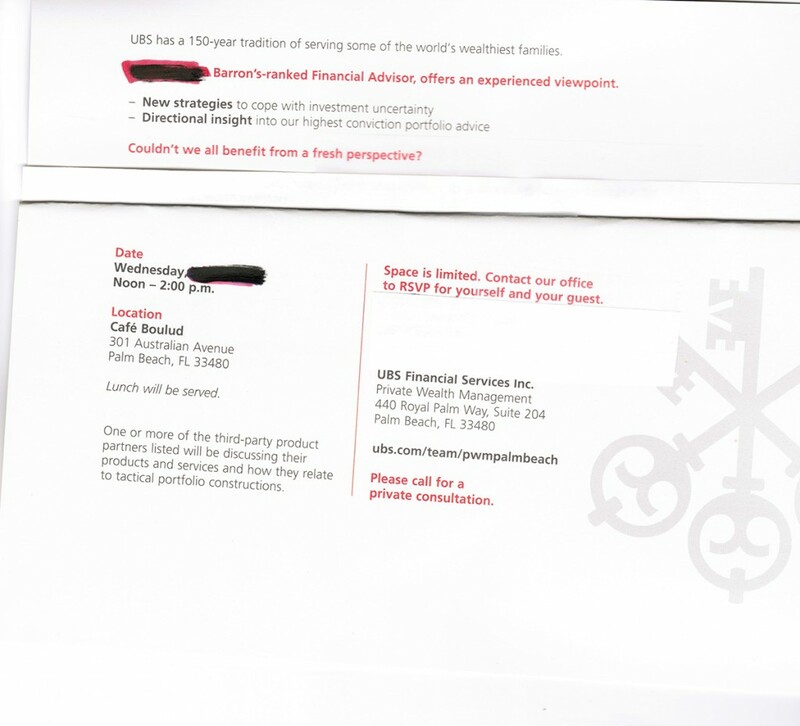 Little else is known about the cozy relationship between UBS and Barrons convention at the Palm Beach Breakers Hotel. Competitors of both Barrons and UBS should be alerted. This is a typical Palm Beach UBS “plate licking” event. Wall Street Journal reports: “The complaint, filed by AM Trust, which says it represents Mr Malik’s heirs and creditors, alleges UBS converted the late political leader’s assets for it’s own use after his death in 1984. … (UBS) used Switzerland’s secrecy laws to lure clients like Malik … Swiss government says a significant amount of money stashed in local banks by foreign political leaders who illegally dipped into state funds.” I1 This form of theft is common at UBS and considered one of their best money makers. A reliable UBS source said each numbered account owner’s heirs are profiled for weakness. UBS allegedly used this procedure with Jewish Holocaust and Bernie Madoff victims. UBS theft from heirs to drug lords, politicians and white slavers et al are particularly easy prey in that the onerous derivation of the assets makes a challenge against UBS looting particularly difficult. UBS NEW CRIMINAL WORD OF INCENTIVISING! Incentivise seems to be a word made up by UBS to explain how they allegedly provide incentives to US lawyers, political operatives, employees, courts, credit rating agencies et al to commit malfeasance against USA governments, clients and other various victims. We see the UBS incentivising program has met with great success within the USA. 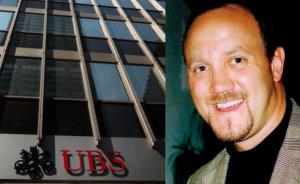 Although once the word was outed by UBS whistleblower Bradley Birkenfeld, UBS was allegedly inundated by those wanting to be incentivised. We now believe the gig is up for UBS and we are reporting it. UBS ALLEGEDLY BUYS OFF OPPOSING USA LAWYERS BY INCENTIVISING THEM? DOES UBS INCENTIVISE CRIMINAL ACTIVITY AGAINST CLIENTS? United States of America vs UBS Personal Bankers Bradley Birkenfeld and Mario Staggl (SD FL Case: 0:08-cr-60099-WJZ-1) U.S. District Court Judge William J. Zloch sitting in Fort Lauderdale, Florida asked: “Why did you help conceal assets? He [Birkenfeld] said: “I was employed by UBS and ‘paid a large salary’ to ‘incentivise’ me.” Asked if his actions at the time worried him, Birkenfeld responded that he ‘did have doubts’ and that he later resigned from the bank.” We see UBS allegedly incentivising lawyers, political operators, UBS PAC recipients, courts, employees, credit rating agencies et al to do things they may otherwise not do against UBS client victims. UBS incentivising strategies will permeate our issues. DOES UBS INCENTIVISE LAWYERS AND OTHER EMPLOYEES TO COMMIT MALFEASANCE? Zubulake v. UBS (Warburg,217 F.R.D. 309 [S.D.N.Y. 2003] United States District Court Judge Shira A. Scheindlin said: “Determining that the employer (UBS) had willfully deleted relevant emails despite contrary court orders, the court granted the motion for sanctions and also ordered the employer (UBS) to pay costs. The court further noted that defense (UBS) counsel was partly to blame for the document destruction because it had failed in its duty to locate relevant information, to preserve that information, and to timely produce that information. In addressing the role of counsel in litigation generally, the court stated that (UBS) ‘counsel must take affirmative steps to monitor compliance so that all sources of discoverable information are identified and searched.’ Specifically, the court concluded that (UBS) attorneys are obligated to ensure all relevant documents are discovered, retained, and produced. Additionally, the court declared that litigators must guarantee that identified relevant documents are preserved by placing a ‘litigation hold’ on the documents, communicating the need to preserve them, and arranging for safeguarding of relevant archival media.” Some of these very lawyers have allegedly been incentivised by UBS to successfully commit similar abuses against a Florida senior citizen within the UBS 3rd District Court, Salt Lake City, Utah. 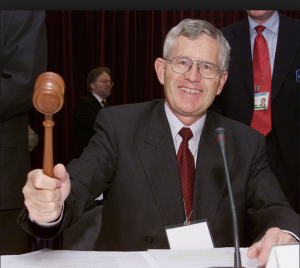 The UBS controversial Industrial Bank and this Utah court have a special relationship. A Florida lawyer was suppose to assist the senior citizen to find out what happened to his Florida UBS mortgage but the Florida senior and his Florida mortgage ended up being successfully deliberated in the UBS Utah court by Utah and New Jersey lawyers, some of the same lawyers allegedly cited by Judge Scheindlin. Reuters reports: “ ‘Credit Suisse Group AG brokers used bait-and-switch tactics in fraudulently steering corporate clients into risky mortgage investments they did not want, federal prosecutors said on Friday. … It was a bait-and-switch scheme,’ Assistant U.S. Attorney John Nowak told the jury in federal court in New York’s borough of Brooklyn. “They deceived clients who had trusted them, and that’s why the scheme worked. … The government accused Butler and Tzolov of misleading clients into believing they were getting securities backed by federally guaranteed student loans, when in fact they got securities backed by collateralized debt obligations or CDOs, often tied to subprime mortgages and other risky loans. ‘Whether the clients were gullible or sophisticated, it doesn’t matter,’ Nowak told the jury. ‘The law protects all kinds of victims. ’ “I4 We hope the US prosecutors use the same standard of protection towards the UBS targeted UBS senior citizen with dementia Client. UBS alleged bait & switch scheme is institutionalized targeting, recruiting, harvesting and processing client victims. It eerily reminds us of the same procedure used during the Holocaust. DOES UBS BAIT & SWITCH CLIENTS IN CREDIT LINE/ MORTGAGE AGREEMENTS? Seniorsavior reports: “Many UBS clients, especially senior citizens in Florida, said they have been solicited by UBS USA for mortgages as noted on UBS mortgage bankers internet site. Those who accept are allegedly told it is part of a credit line/mortgage package. After signing, UBS purges the mortgage part of the agreement. UBS then maintains complete control of the client liquid assets. UBS then dispurses client assets to other UBS affiliates through shifting (cross over) or offshore (cross border) manipulations. Client assets are dissipated. If a client objects to the procedure they are immediately brought to the purposefully remote improper venue of UBS 3rd District Court, Salt Lake City, Utah (allegedly known by Utah lawyers as the UBS judicial slaughterhouse) for processing. The court allows the mortgage part to be wrongfully adjudicated by UBS New Jersey and Utah lawyers and dismisses discovery requests. The court then gives UBS summary judgment solely on the credit line that is sometimes allegedly fraudulently fabricated against State and Federal Banking Regulations. UBS then takes the judgment back to the rightful and proper venue for enforcement. UBS PAC (UBS Americas Fund for a Better Democracy) is active in Utah and targeted senior citizen areas, primarily Florida. Crucial political operators are allegedly incentivised by UBS through its PAC to obfuscate any objections to the scheme.” I5 In the below Exhibit L UBS has created and subjected a Florida senior citizen Client to UBS AG Switzerland offshore (cross border) accounts. This alleged siphoning of his numerous and confusing UBS crossover accounts was done with neither UBS Client knowledge nor consent, violating SEC 1934 Act. Former UBS Chairman Raoul Weil was never asked by Obama political appointees like Holder or Brueur anything regarding UBS international criminal activities, somehow. 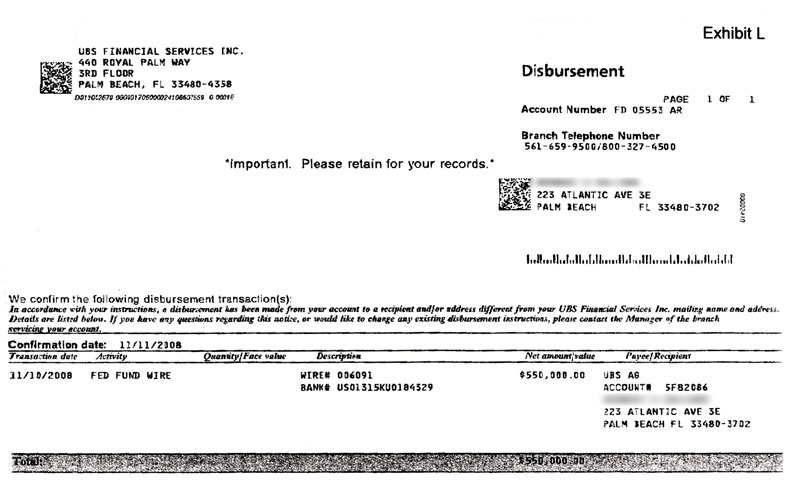 This is a UBS offshore (cross border) wire transfer of a Florida UBS senior citizen Client’s entrusted assets and identity from UBS USA to UBS AG Switzerland. We see it says: “In accordance with your instructions.” The UBS Client neither knew about it nor instructed anything of the sort. It was brought to his attention by tax authorities. His mortgage/credit line accounts were part of the mandatory UBS full service and thus completely controlled by UBS. He was unaware of these money transfers to either unknown UBS numbered Swiss cross border accounts or crossover UBS USA accounts. It is a violation of the SEC 1934 Act for UBS not to have a written copy of all transfer authorizations from the Client. There are none. This letter has been consolidated to remove the alleged IRS/Swiss oriented confidential misrepresentations of the truth. Please note Chairman Caspar Villiger of UBS AG is thoughtfully involved and received a cc. We praise Chairman Villiger for his time benefiting UBS AG stockholders, Swiss taxpayers and hopefully a recreated UBS USA culture. If any responsible parties wish an unexpurgated copy, we will accommodate. This letter needs no explanation as to its evasiveness and deniability. The senior citizen Client has voluminous documents where UBS attempts to use “mistake” and “inadvertence” to explain deliberate acts of alleged fraud. One cannot but wonder why all of these cited accounts are needed, other than to obfuscate and otherwise confuse the Client and IRS. We will see later where UBS won $1+ million using the same shifting, comingling et al against Wells Fargo. UBS has emphatically said within numerous documents all of the above Client accounts, assets and mortgage are within their possession. The Client, tax accountants and the IRS have repeatedly been denied access to them. UBS wants the senior citizen Client to submit all of the above accounts, codes and offshore transactions to the IRS without verification, making him culpable to their alleged fraud. Initially, all the senior citizen wanted was a simple mortgage for tax write-off. The reply was signed by Kyna Ruiz who was soon after terminated with whereabouts unknown. The entire UBS Laurel, New Jersey mortgage department was also terminated with . Mortgagors were told there was a short interval of time before an outside staff was hired to deal with the abandoned mortgagors and attempt to reconstruct shredded USA Federally mandated documents. Attorney General Eric Holder’s office would take no action even though it was similar to UBS AG Zurich burning Holocaust documents as herein reported. UBS then received USA billions taxpayer dollar bailout. Cloud et al archived documents exist. Elderly attempting to get their money from UBS. We read your letters to the editor and determined our brokerage needs your assistance as well. We have had UBS try to steal our clients and need help keeping them with honesty. You provide that honesty as a third party to our customers. If we see any of the illegal UBS activity we will send it to you. I am Swiss and live in Geneva. Do you think that UBS could bring bankruptcy next time to Switzerland because of their reckless behavior you have been so kind to expose? We were attracted to your web page by an article in our Swiss paper. 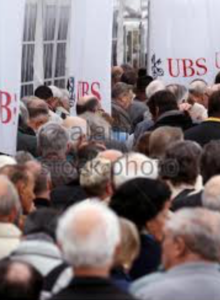 Swiss senior citizens have had problems with UBS as well. We can’t believe the Government gave bailout money to UBS? They said they sold the shares back but we know UBS can’t last and will need more of our money. That is our money and you have told us how it being spent. Do you have any more information about the secret deals of our Swiss government and UBS? UBS is continuing its quest for rich Florida senior citizens by sponsoring the Basil Art Show in Miami, Palm Beach Antique show and Palm Beach International Croquette Tournament, among others. Do you have a list of other things they sponsor? Marten Hoekstra toots he does something with prisoners in the United States. Is he getting to familiarize himself with what could be his next domicile? What is he doing to that poor Palm Beach senior citizen? Aren’t there laws against UBS doing these things? 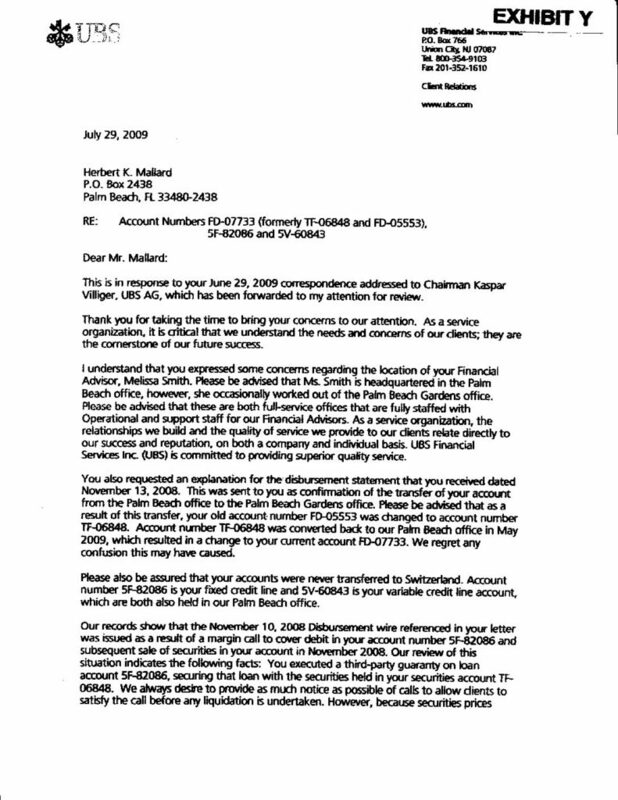 Seniorsavior.com found out that a Florida senior citizen had contracted with a local lawyer to bring a local action against UBS. In fact, during legal discussions with a UBS lawyer his lawyer was solicited to hide while the Client was hunted down by a UBS process server with a summons to appear in a UBS Utah court on fabricated civil charges. The Client lawyer wrote a letter but never took any action. The Client lawyer even charged him for the UBS lawyer solicitation discussions. UBS has a special relationship with a Utah court and will go to extremes to allegedly entrap a client deemed a threat. This senior citizen Client still receives bills from the Florida lawyer even though the Client is being processed through the Utah court. The senior citizen luckily kept all of the documents but there is no practical recourse for senior citizens in Florida against such matters. Seniorsavior.com has been canvassing internationally for UBS UHNW Clients and has been very successful in finding them. Again, the world of the super rich is very small. They congregate in the same geographic and social places. We will have more of these UHNW client/broker prophiles coming in future issues. We expect zealous competitors will make queries. We are giving you a smattering of how UBS works in reality. UBS allegedly has a penchant for duplicitous actions. Ms Ruiz gives us in her letter contradictions glossed over with happy talk and condescending platitudes. She has a difficult job indeed in explaining how prima facie (on its face) wire transfer documents and resulting offshore accounts do not exist. Most curious, she has no quandaries at reeling off the complexities of UBS accounts to a senior citizen Client with known dementia recruited for a simple mortgage. We will be exposing other cryptic UBS codes in hopes that someone will be able to decipher them. We cannot say how refreshing it is to have a true leader like Chairman Kaspar Villiger at the helm of UBS AG, something UBS USA desperately needs. We hope he will continue to oversee and learn from these matters that would otherwise be kept from him. We have reported how Chairman Ospal surrounded himself with yes men who kept the truth from him, else they were dismissed. Others in between Ospal and Villiger were over their head and could not in conscience deal with the malfeasance. Chairman Villiger hopefully gains sustenance from our critique. We and our readership will be watching, intently.